The coming unity of the saints. If I were to simply ask the question ” what does it mean to overcome?” or to be an overcomer, I am sure I would get many different answers. The word ” overcomer,” in the Greek means to “Conquer, to subdue, to prevail and to get the victory.” Now if one is earthly minded and walked with the notion that we have been called to live our best life now, one might believe that to overcome is to have victory over the circumstances of our lives. This may include health issues or wealth issues. So to those who believe in that way, overcoming would mean getting a healing when one is sick. Or, if one is dying then being delivered from death. It could also mean that if one is poor, then by becoming rich one has overcome their poverty. Now, does God heal? Yes He does. Can He raise a man from his death-bed, or indeed raise the dead? Yes of course. Can he take a poor man, a pauper and raise him up to walk with kings? Yes He can and has often done so. Are any of these formulas whereby God must act? No. God alone chooses who he raises up, whether it is from poverty or from a bed of sickness or a bed of death or even death itself and He does it for His own will and His own good pleasure. A report from our Gathering. Below is a report I received from a dear brother and Pastor from California. He is South African but has been living in the States for a decade. He joined us a couple of weeks ago at a gathering we had at a camp-ground in Missouri ( not tents, I am too old for tents) There were about 25 of us from North America, but the backgrounds were much more varied. We had Americans, Canadians, myself from Scotland, South Africa and Sierra Leone. Within this group we had further diverse backgrounds which included those from Baptist backgrounds, Pentecostal, Conservative families, Mennonites and non-denominational. Please read his report below, it echo’s my own thoughts about the gathering and was exactly what we who called this meeting were seeking, praise God………. Brother Greg from Sermon Index invited me to attend a conference at camp grounds in Missouri during the week of 17 March. I did not know anything about the various participants beforehand except for some communication with Brother Greg and having read most of the Principles book, produced by Gospel Fellowships, the organizers of the conference. The conference was unlike any other I had ever attended. There was no preaching, no agenda and no program. About 25 brothers and sisters gathered from various parts of the US and Canada with one purpose and that to spend time in communion – communion with the Lord and with one another. The conference was also different in that there was no food! The two days had been set aside as fast days. From the moment I was collected at the airport to the moment I was dropped off again, for four days there was only one theme – the Lord and His Word. There were no conversations about sport, politics or anything of the world. This was not because there were rules against such things but because each person had only one driving passion – to know, and honor the Lord. On the 21st it was Down Syndrome day. The 21st representing the fact that Down Syndrome people have an extra copy of chromosome 21. 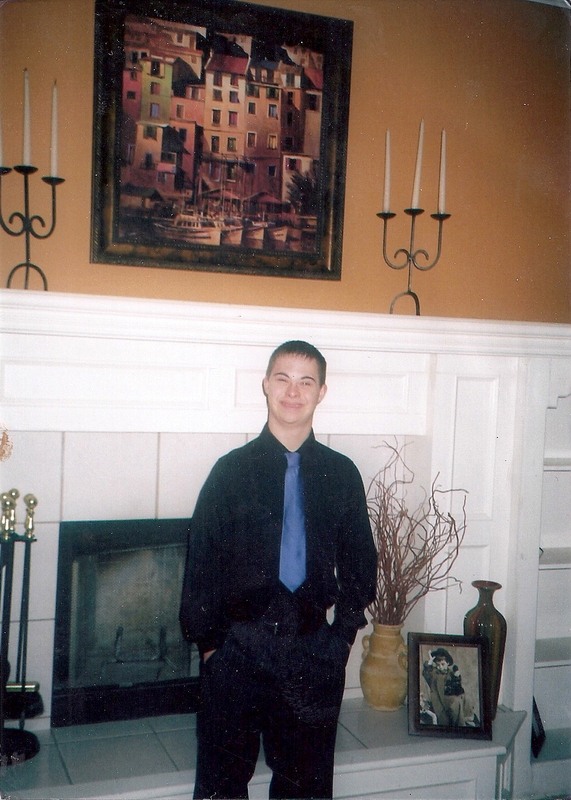 I am the father of a young man with Down Syndrome , Daniel , who will be 21 this year. The word ” extra,” is interesting to me. Daniel is not missing anything, he has an extra chromosome. Now as the world measures things he has something missing, intellect. Yet, when he looks at the world he is c olor blind. He is incapable of being racist. He loves equally. Men, woman, the old, the young, the rich, the poor, the infirm, the mentally or physically handicapped, Daniel sees none of that, he only sees people. This extra Chromosome allows him to view the world as God views the world. My son is happy and contented. I have watched other children mock him sometimes and burned inside, and then he would come in and tell me how much he liked them and that they were his friends. He would bear no ill will or grudges towards them and the very next day approach them and embrace them. This rarely made his Christian father happy. Three days after he was born, in the midst of great turmoil and darkness the Lord Himself came and whispered in my ear ” I have given you a perfect gift from the treasures of heaven.” This is the clearest word I have ever had from the Lord.Daniel, exactly who he was, was made perfectly by the designer of all that exists. Daniel indeed has something extra, it is God given and I could only wish that I viewed the world through his eyes. This group of people are not people who have an illness, they are a race of unique people with something extra. And that something extra should help us reevaluate how we measure perfection. If God is no respector of persons, if He loves all equally , then who is closer to the heart of God? Daniel or his dad? Without a doubt, Daniel is closer to the heart of God and I an observer and one who learns from those who have something extra, a God gene. He does not have less than me, I have less than he. Trust is the foundation of our unconditional relationship with Jesus. Jesus said it in the Garden ” thy will be done,” even although He asked for that cup to be taken from Him. It is so important because without trust and obedience there can be no relationship with God. Just imagine not being able to trust our husbands or our wives, we would have no relationship.It is the same with God and it must be unconditional trust. This mirrors His unconditional love for us. The Word of faith movements and the prosperity teachers urge us to trust in faith and the power of our words to achieve what we desire, yet what does God desire?. Trust and faith and obedience is matured in the crucible of life and its many trials. Jesus is the Way-Not my will but thine be done. And then He set His face, He steadfastly embraced the cross to the Glory of God and the redemption of man. Will you set your face today? Will you simply trust and obey? If the greatest darkness the world has ever seen( Calvary) produced the greatest light the world has ever seen (The resurrected Christ) then we who are alive and remain just prior to His coming back will witness the greatest light since Jesus walked the earth. There is a great darkness that is slowly covering the world, there is a great light that is coming out from the midst of it, God’s remnant saints. And the world will know that the Father sent the Son for they, in that day, will stand as one. The Father and the Son abiding in His called out ones by the power of the Holy Spirit. The Church is who we are.